Tomato soup with Cheddar Cheese is an exciting variation of Tomato Soup posted earlier in my blog. I have few packets of cheese, the variety including cheddar, mozzarella, parmesan, goat stacked up in the refrigerator for some months. Ever since I have been putting some serious efforts to weight reduction, some of the items that were regular in consumption at my home have been salted away for occasional use. Now that I have successfully shed some kgs and the change in appearance is conspicuous, I feel encouraged to try some cheese into my food. I love tomato soup as it is, with or without cheese. But an addition of cheese boosts up the flavour noticeably. Teamed up with garlic bread or a bowl of salad, this is a great treat for dinner. 1) Heat oil in a saucepan. Add onion when oil turns semi hot. Fry the onion till translucent. 2) Add garlic and shallow fry. Add the tomatoes and cook till tomatoes soften. 3) Add vegetable stock and bring the soup to a boil. 4) Add yogurt and cheddar cheese. Season with salt and black pepper. Add oregano and basil leaves. 5) Cook till yogurt and cheese incorporate nicely into the soup. 6) Turn the heat off and let the soup cool down a bit. 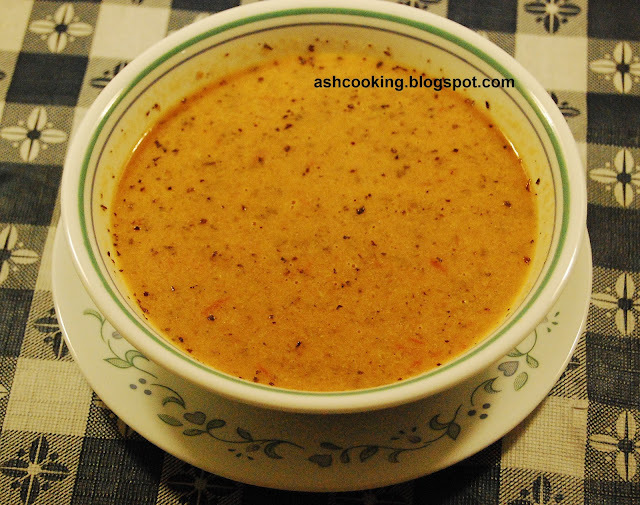 7) Using a blender or food processor, puree the soup to smooth mixture.